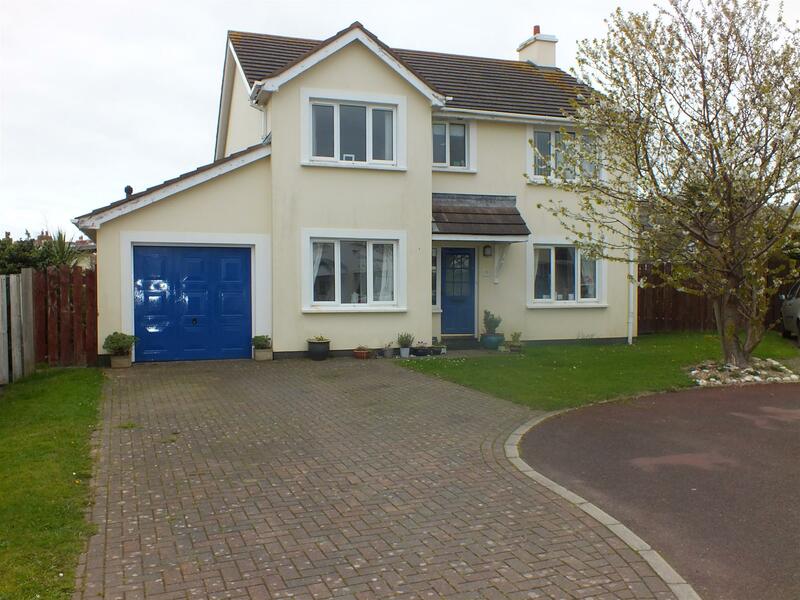 Modern Detached Family House in a Pleasant Cul De Sac within the Village. Traditionally Built by Reputable Local Builders Hartford Homes. 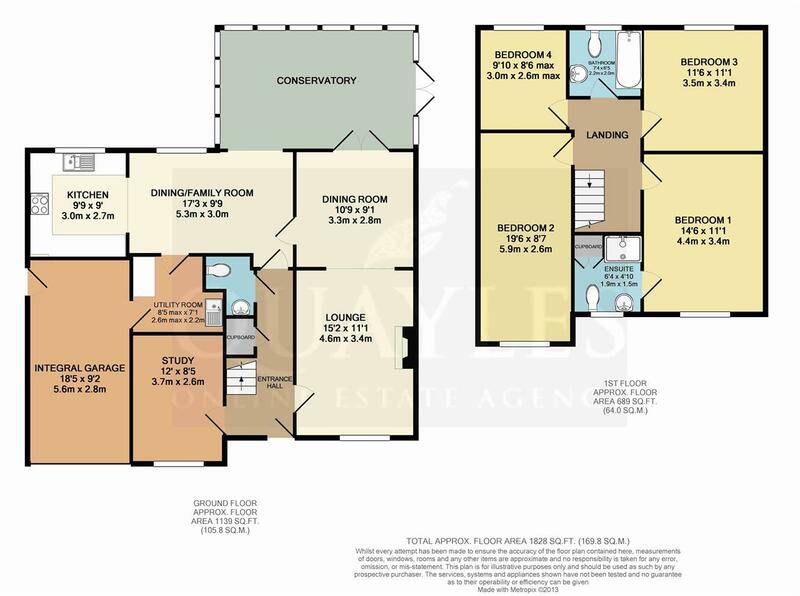 Generous Lounge, Dining Room, Study/ Bed 5 & Superb uPVC Conservatory. Breakfast / Family Room & Semi Open Plan Kitchen with Appliances. Utility Room, Cloakroom & Integral Garage. 4 Good Size Bedrooms (Master En Suite) plus a Family Bathroom. Extensive Parking for Approximately 4 Cars & Open Plan Frontage. Mature, Enclosed Rear Garden with Lawn & Deck. Travel into the village in a northerly direction passing the primary school and village pub. Turn left just prior to the old IOM Bank building into Station Road. Continue ahead taking the second left into Shore Road then first left into Cleiy Rhennee. Bear left then right where the property will be found on the left, being clearly identified by our For Sale board. Decorative half double glazed entrance door and uPVC side light. Stairs lead to first floor with a storage cupboard beneath. Doors to study, lounge, kitchen and cloakroom WC. Quality 'Karndean' oak effect floor covering. Ceiling cornice. Smoke detector. Having a uPVC window to the front elevation. Ceiling cornice. Television and telephone point. Oak effect laminate floor covering. A bright and spacious room with a uPVC window to the front elevation. Feature fireplace with an inset electric fire, marble hearth and surround. Outlook across the front garden. Ceiling cornice. Television, telephone and satellite points. Clear opening to the dining room. A pair of glazed uPVC doors open into the conservatory. Door to kitchen. Ceiling Cornice. A superb space which is equally suitable as a playroom or second reception room, heated for year round use. Enjoying a pleasant outlook with double doors leading out to the garden. Plenty of opening top lights. Tinted polycarbonate roof. 'Karndean' oak effect floor covering. Clear opening to family room. Naturally separated into 3 areas and having quality 'Karndean' Oak effect floor covering throughout. A uPVC window overlooks the rear garden. Telephone point. Doors to the utility room and reception hall. Clear opening to kitchen. Fitted with a good range of 'limed Oak' fronted wall and base units with contrasting background tiling and granite effect worksurfaces incorporating a 1 1/2 bowl stainless steel sink with mixer tap. 'Indesit' double electric oven and 'Hotpoint' 4 ring gas hob with extractor above. Integrated fridge and 'Electrolux' dishwasher. Natural light provided by a uPVC window to the rear elevation. Base unit with stainless steel sink and drainer. Space for washing machine. Ceiling cornice. 'Karndean' oak effect floor covering. Door to garage. Fitted with a modern white suite comprising WC and hand basin with tiled splash back. Extractor fan. 'Karndean' oak effect floor covering. A spacious area with a built in linen cupboard and loft access. A generously proportioned double room with a uPVC window to the front elevation. Television point. Ample power points. Door to the en suite shower room. Fitted with a modern white suite comprising low level WC, pedestal basin with tiled splash back and an enclosed shower. Obscure glazed uPVC window. Shaver point. Built in cupboard. A particularly long double bedroom with a uPVC window to the front elevation. Ample power points. Television point. A double room with a uPVC window to the rear elevation enjoying garden and distant mountain views. Ample power points. Television point. A large single room having a uPVC window to the rear with garden, hillside and distant mountain views. Ample power points. Television point. Fitted with a modern white suite comprising low level WC, pedestal basin with tiled splash back and shaver point. Panelled bath with mixer shower attachment and tiled surround. Glazed shower screen. 'Vynil' floor covering. Extractor fan. Obscure glazed uPVC window. A good size, enclosed garden. Mainly laid to lawn with planted borders and palisade fencing. Large decked area ideal for outdoor entertaining. Gated access to the front of the property. Mostly laid to lawn with a long, wide driveway offering a good amount of off road parking space. Having an up and over garage door. Fixed wall shelving. Half glazed door to the side of the property. Energy efficient 'Glow Worm' gas fired condensing boiler - installed approximately 2009 - 2010.